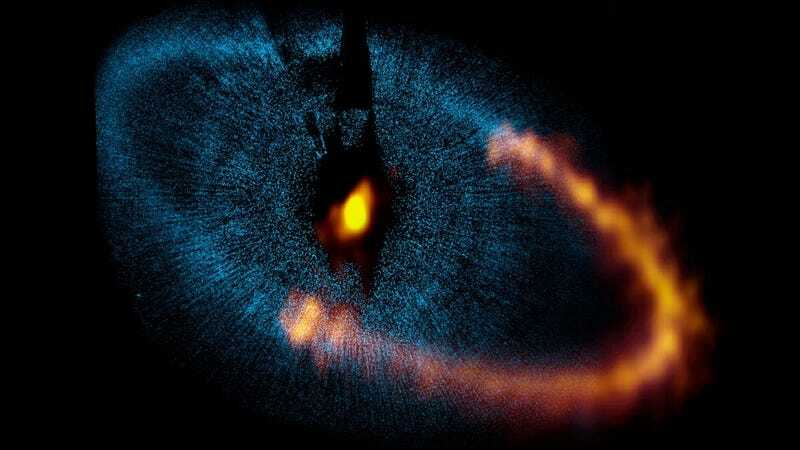 If Saturn was a star, it might well be Fomalhaut. Much like our neighboring gas giant, this star is surrounded by a gigantic ring of dust. The disc gets its sharp, ring-like structure from two planets, one on either side. The star Fomalhaut is about twice the mass of our Sun, and that extra size is enough to radically shorten its likely lifespan. It's only about 100 to 300 million years old, and most likely it's only got about a billion years worth of hydrogen left before it runs out. One of its two planets, the inner world Fomalhaut b, was discovered by the Hubble Telescope in 2008, becoming the first exoplanet to be spotted in visible wavelengths. Its massive ring is located about 140 astronomical units (AU) from the star itself, meaning it's 140 times the distance between the Sun and Earth. The entire ring is about 16 AU wide, and its edges have a sharpness to them that is unusual for what appears to be a protoplanetary disc. Astronomers realized there would need to be two planets orbiting the star to shape the disc in this way, so another planet would have to be lurking out there beyond the disc. Now, the European Southern Observatory has found evidence for the second planet around Fomalhaut, and they also have discovered the first planet was much, much smaller than originally thought. The Hubble data suggested Fomalhaut B was at least the size of Saturn - in fact, both planets are between the size of Mars and a few times that of Earth - any larger and their masses would destroy the ring. They would also be incredibly cold worlds, considering both are about three times the distance from their star as Pluto is from Earth. For more, check out the ESO website.